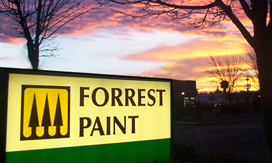 Since 1973, Eugene's Forrest Paint Company has proven that high environmental ethics and robust business success can go together. The company was founded to provide industrial coatings and superior technical support to northwest manufacturing companies. Over the last 40 years, the company has established itself as a leader in niche products used by industrial producers of heating appliances, heavy equipment, wood products, high tech machinery, snowboards, contractors and consumers. Forrest Paint has long been a leader in sustainable business practices that protect and preserve the environment. The family-owned company starting recycling its own paint years before the state of Oregon set up such a program and the company also collects and recycles paint from other manufacturers too. In 2010, the Eugene Chamber of Commerce recognized their efforts with a nomination for the Emerald Award for Environmental Values. Forrest recently entered its second generation of family leadership, and has focused on developing specialty products that have unique market niches. The company also has been proactive in protecting the environment, through investments in low emissions technology like powder coatings and UV curable and water-based coatings. More than a decade ago, Forrest was the first paint manufacturer in the country to reduce emissions by installing a biological system to "compost" air pollutants from its factory. Business Oregon has been a partner with the company since 2002 when we provided it with a $400,000 Oregon Business Development Fund (OBDF) loan. At that time, the company had only 19 employees and hoped to add 10 more. Well they did, and then some. By 2013, when Business Oregon provided a second OBDF loan in the amount of $334,000 to help the company expand its manufacturing operations, it had more than 100 employees and hoped to add 18 more over the next three years. In between, in 2012, Business Oregon also provided the paint maker with a $5,000 State Trade and Export Promotion (STEP) grant to help defray its costs of exhibiting at the Progetto Fuoco trade show in Verona, Italy. The company is known worldwide for its Stove Bright® brand of high temperature coatings, which have been sold on six continents. All of the company's products are manufactured in Oregon, and about one quarter of which are exported outside the U.S., bringing revenue back to the state economy.